– Date: 8th November, Saturday. Over 70 iOS developers, who own an iOS app in the iTunes store, have registered for the event and we plan to invite 25 worthy developers from this list who will walk into our office at #316, 100 Feet Road, Indiranagar.. with? well, just their thinking caps on and yes Macbooks running Xcode 6 or above. No registration or any hidden charges. This event is absolutely free for passionate iOS developers. Haven’t you requested an invite yet? Do it now, before it is too late! Read about the rules & prizes carefully. 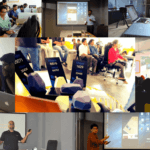 – Marathon hands-on training sessions on iBeacon basics. – An environment to hack and come up with an amazing, location-enabled app. – Prizes worth over Rs. 20,000 and enough and more beacons! Also, our engineers are sprawling around the office with…arms and ammunitions!, well no…just beacons actually! Don’t trust me? Here you go! If you walk into our office any time this week – the first few questions you will be asked are: -Are you an iOS Developer? -Want to break into the hottest new technology? -Looking for a REAL challenge? If you happen to say ‘Yes’ to these, you will have dozens of people shouting back : “HACK AWAY at our Hackathon! !” It’s totally crazy in our office here – we are all thinking, talking, hacking and eating beacons! Yeah eating was an exaggeration… but hacking, yes! Check these pictures from our recent internal hack day! 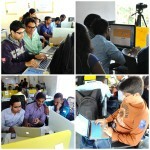 Calling all you iOS hackers in India to come and build some awesome apps! You never know, your app could be the most ground-breaking beacon app, that can get you prizes worth Rs. 20,000! So, join us this Saturday for unlimited food, fun, and loads of learning!